The U.S. has many of the best universities in the world, but according to a new global list, it doesn’t have the best. The University of Oxford, the oldest in the English-speaking world, took the top spot in the latest World University Rankings, released annually by Times Higher Education. The English university dating to 1096 dethroned the California Institute of Technology, a small, private school in Pasadena that had ranked No. 1 for five-straight years, according to Times Higher Education, a London magazine that tracks higher education. This is the first time a university outside the U.S. is No. 1 in the list’s 13-year history. This year’s list also underscores strengthening university systems in Asia as schools in China and Hong Kong have risen up the ranks, some by double digits. Besides the Oxford-Caltech flip flop, the top of the list remained mostly the same as last year. Stanford University came in third, then the University of Cambridge, another U.K. institution founded in medieval times. The Massachusetts Institute of Technology came in fifth, just ahead of its Cambridge, Mass., neighbor, Harvard University, the top Ivy League school on the list. To a lesser extent, WUR also emphasizes global scholarship. Unlike popular American rankings, like those produced by U.S. News & World Report, the list has a global reach and includes only universities. WUR excludes popular metrics used by U.S. ranking systems like acceptance rate, test scores and postgraduation salary, Mr. Baty said. Oxford’s boost came from an exceptionally strong research income and global collaboration. 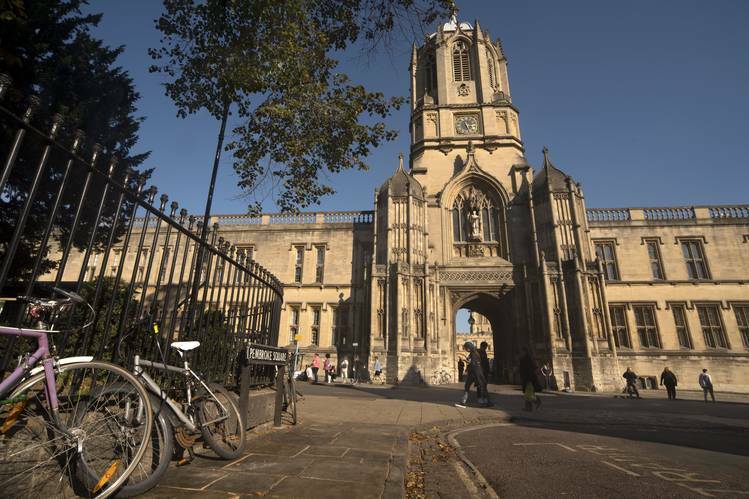 The university secured record research income of £522.9 million, or $679 million at today’s exchange rates, from external funders in the 2014-2015 academic year, said Louise Richardson, vice-chancellor of Oxford.“Industry, charities, health organizations and many other funders are all keen to invest in Oxford research,” said Louise Richardson, vice chancellor, chalking up the record funding to the strength and talent of the university’s scholars. Further down the list, Asian universities have soared past some of the most prestigious institutions in Europe and the U.S. The number of Chinese universities in the top 200 doubled to four this year. China’s top school, Peking University (No. 29), a public school in Beijing with about 30,000 students, ranked above New York University (No. 32). Over the past eight years, China has invested the equivalent of roughly $33 billion in developing a group of elite universities through two government initiatives. “This is meant to be the year that China overtakes the U.S. on science research and science publication,” said Mr. Baty, adding that the country is already leading the world in the number of scientists. China’s Tsinghua University (No. 35), another large, public university based in Beijing, ranks ahead of Ivy League school Brown University. The University of Hong Kong (No. 43) and Hong Kong University of Science and Technology (No. 49) also come in ahead of Brown, which ranks 51. Part of China’s rise has to do with schools putting more weight on surveys like Times Higher Education’s world rankings, and efforts to lure back reputable Chinese and Chinese-American researchers from American universities, said Mr. Baty. Another government initiative aims at making six Chinese universities leading global institutions by 2020—some of them in the world’s top 15 by 2030, said Mr. Baty. The highest-ranked university in Asia is the National University of Singapore, a school of about 38,000 students that offers degree programs heavily subsidized by the city-state’s government, according to its website. At No. 24, that school ranks a slot above the London School of Economics and Political Science. Meanwhile, U.S. institutions kept their dominant presence on the list. American schools account for about one-third of the top 200 schools, same as last year. British universities make up 16% of the list, down a percentage point from last year, and Germany claims 11%, up a percentage point. Notable movers in the U.S. include the University of California, Berkeley, which returned to the top 10 by tying the University of Chicago at No. 10. Schools that rose into the top 200 this year include the University of Illinois at Chicago, ranked 200, and Northeastern University in Boston, ranked 182. Schools that fell out of the top 200 include the University of Utah and Boston College. Times Higher Education is a unit of TES Global Ltd., a London company owned by private-equity firm TPG Capital since 2013. Times Higher Education was sold in 2005 by News Corp., the parent of The Wall Street Journal owner Dow Jones & Co. Times Higher Education has a business relationship with The Wall Street Journal to develop college rankings. At least nine states will charge ahead with marijuana initiatives on ballots in November — a record number—despite the federal government’s decision not to loosen restrictions on the drug, underscoring the precariousness of any type of legakrecognition. Meanwhile, those in Florida, Arkansas and North Dakota will vote on starting full-fledged medical marijuana programs, and Montana voters will de­cide whether to loosen restrictions on their state’s existing program. Got it? CNN paints the poor old boy as a victim. And gosh! What in the world would cause anyone to wish harm upon this inoffensive health-care provider? After all, his only offense was to dispossess mobsters and provide free and fabulous healthcare and education to his formerly wretched and exploited countrymen.